Here's some artwork in the spirit of such projects as Jim Hines' fantasy book photoshoot and Wonder Woman's pose being assumed by the rest of the Justice League. I get that some of these characters are "using their sexuality to blind men so they can attack them," and I bet that could be an effective attack. But there are so many chicks doing this that even the dumbest, most weak-willed superhero/villain is going to catch on eventually. What's the bold alternative to this played-out strategy? To quote the artist, "SO MUCH BULGING MAN PELVIS!!! For everyone!" 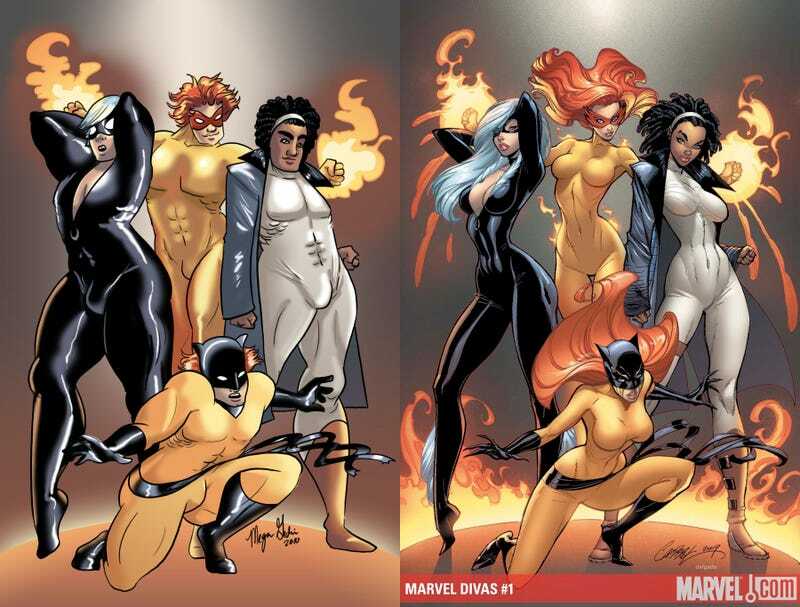 That J. Scott Campbell piece at top has certainly become a hydra of codpieces.